Explain how this circuit works, and what waveforms will be measured at points A and B. Be sure to make reference to RC time constants in your explanation. You will measure a sawtooth-like waveform at point A, and a square wave at point B. Challenge question: explain how you might go about calculating the frequency of such a circuit, based on what you know about RC time constant circuits. Assume that the opamp can swing its output rail-to-rail, for simplicity. This circuit is best understood by building and testing. If you use large capacitor values and/or a large-value resistor in the capacitor's current path, the oscillation will be slow enough to analyze with a voltmeter rather than an oscilloscope. As many opamps and comparators are incapable of rail-to-rail output swings, this question is quite realistic. The stability of the stone in each of these scenarios represents the stability of a specific type of electrical feedback system. Which of these scenarios represents negative feedback, which represents positive feedback, and why? 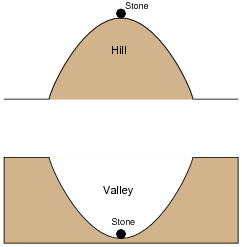 The valley represents negative feedback, while the hill represents positive feedback. I have found this simple analogy to be most helpful when explaining feedback systems to students, because the behavior of each is intuitively obvious. Draw a schematic diagram of this faulty circuit, and determine what the voltmeter's indication will be, explaining why it is such. The output voltage will saturate at approximately +11 volts, or -11 volts, with the potentiometer having little or no effect. Ask your students to characterize the type of feedback exhibited in this circuit. How does this type of feedback affect the opamp's behavior? 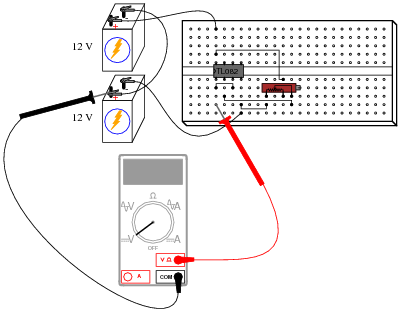 Is it possible for the opamp to function as a voltage follower, connected like this? For your information, this circuit configuration is often referred to as a Schmitt trigger. With no feedback resistor, the "trip" voltage would be 9.21 volts. With the feedback resistor in place, the "trip" voltage would change depending on the state of the opamp's output! Follow-up question: describe what effect this changing "trip" voltage value will have on the operation of this comparator circuit. Schmitt trigger circuits are very popular for their ability to "cleanly" change states given a noisy input signal. I have intentionally avoided numerical calculations in this question, so that students may concentrate on the concept of positive feedback and how it affects this circuit. The circuit works well to warn of high wind speed, but when the wind speed is just near the threshold level, every little gust causes the alarm to briefly sound, then turn off again. What would be better is for the alarm to sound at a set wind speed, then stay on until the wind speed falls below a substantially lower threshold value (example: alarm at 60 km/h, reset at 50 km/h). Explain why this circuit alteration works to solve the problem. 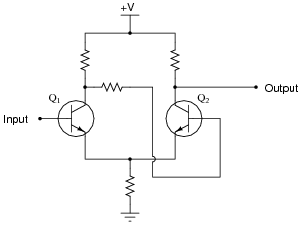 The added resistors provide positive feedback to the opamp circuit, causing it to exhibit hysteresis. Challenge question: suppose you wished to increase the gap between the upper and lower alarm thresholds. What resistor value(s) would you have to alter to accomplish this adjustment? A practical illustration for positive feedback in an opamp circuit. There is much to discuss here, even beyond the immediate context of positive feedback. Take for instance the oscillator circuit and on/off control transistor. For review, ask your students to explain how both these circuit sections function. Challenge question: how would you recommend we change the circuit to give threshold voltages of +6 volts and -6 volts, respectively? Ask your students to explain what the terms üpper threshold" and "lower threshold" mean with regard to input voltage in a circuit such as this. Challenge question: how would you recommend we change the circuit so that its threshold voltages are centered around some voltage value other than zero? 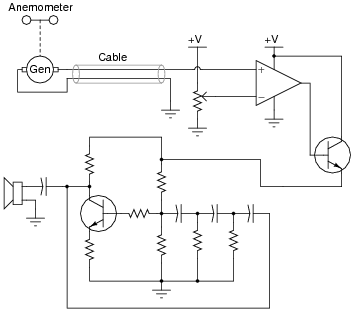 Comparators with positive feedback are sometimes referred to as Schmitt triggers. Suppose you needed a Schmitt trigger for a circuit you were building, but did not have any more integrated circuit comparators or op-amps to use. All you have available to you are discrete components. 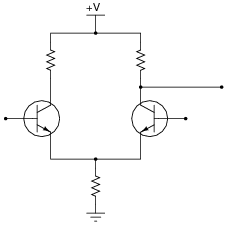 Is there any way you can think of to modify the following discrete transistor differential pair so that it behaves as a Schmitt trigger? Ask your students to determine whether this Schmitt trigger circuit is inverting or non-inverting. Have them explain their reasoning step-by-step. Authors Paul Horowitz and Winfield Hill, in their book The Art of Electronics, say that Q1's collector resistor must be larger than Q2's collector resistor in order for this circuit to work properly (page 232, second edition). Positive or regenerative feedback is an essential characteristic of all oscillator circuits. 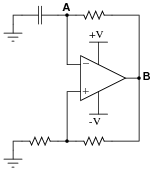 Why, then, do comparator circuits utilizing positive feedback not oscillate? Instead of oscillating, the output of a comparator circuit with positive feedback simply saturates to one of its two rail voltage values. Explain this. The positive feedback used in oscillator circuits is always phase-shifted 360o, while the positive feedback used in comparator circuits has no phase shift at all, being direct-coupled. This is a challenging question, and may not be suitable for all students. Basically, what I'm trying to get students to do here is think carefully about the nature of positive feedback as used in comparator circuits, versus as it's used in oscillator circuits. Students who have simply memorized the concept of "positive feedback causing oscillation" will fail to understand what is being asked in this question, much less understand the given answer.